The Broach Sharpening Machine (further referred to as the “machine”) is manufactured under the performancespecification approved by the Buyer, has its original number and is designed for initial sharpening and resharpeningof round, spline and flat broaches made of tool, high-speed steel and carbide composition by abrasive,boron nitride and diamond grinding wheels. possibility of exchanging information with higher rang PC. SINUMERIK 802D CNC device enables to control positioning along four axes. Digital drives of SIMODRIVE611UE series with electric motors of 1FK7 series are used as servo drives. A table on rolling element guideways is mounted up the base. There is an area in the back part of the basewhere a column is installed. A cross carriage with wheelhead is fastened on the column’s carriage.A wheelhead spindle swivels in the vertical plane to the angle corresponding to the face or clearance angle,and in the horizontal plane – to the helix angle of the flat broach.Headstock is mounted in the left part of the table and tailstock – in the right part. All necessary accessoriescan be fixed there as well. An electrical cabinet is placed behind the base, left to the column. In this mode all sharpening actions (leading the grinding wheel into the chip flute, leading the wheel tilltouching the tooth, removal of rough and finishing stock, sparkout, transition to the next tooth) are performedwith the help of electronic handwheel or buttons on the operator panel. The value of the removed stock can becontrolled on electronic indication on the screen. In this mode broach sharpening is performed according to control program (CP). Broach geometrics (diameter,number of teeth, broach teeth angles, etc. 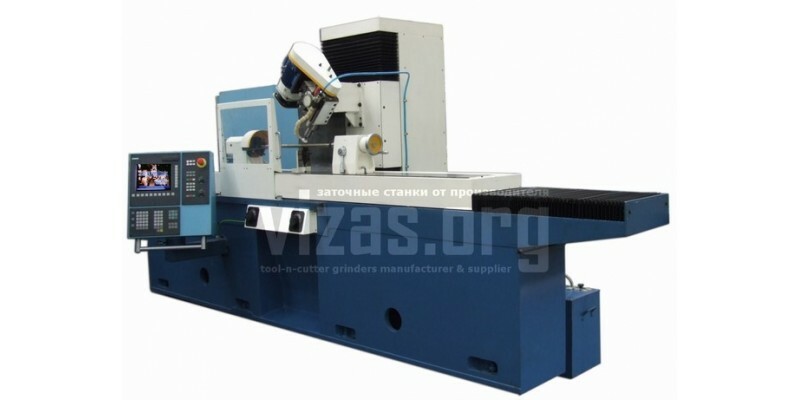 ), technological parameters of sharpening (speed of cutting,rough and finishing stock, rough and finishing depth of cutting, number of sparkout rotations, etc.) are input intoCP. 1 stage – measurement of tooth pitch and increment. 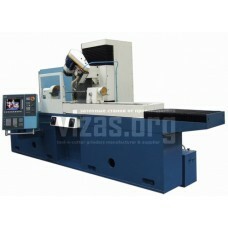 Measurement is performed by touching of the surfaceto be sharpened by the grinding wheel. Travel before touch is performed manually by handwheels. After thatoperator activates CP, which records pitch and tooth increment for the current tooth and positions roughly thegrinding wheel to the following tooth. Operator touches the next tooth and so on until the selected number ofteeth is measured. Measured pitch and tooth increment can be stored in the CNC system or external media for further use. Ifthe pitch and tooth increments have been prestored they may be used and stage of measurement can beskipped. 2 stage – broach sharpening. Sharpening is performed automatically. During this process rough and finishingstocks are removed from each tooth, sparkout and indexing for the following tooth are performed. The grindingwheel can be dressed between the sharpening cycles after machining of the given number of teeth. Dressing isperformed manually by dressing mechanism. After dressing the operator touches the last sharpened tooth inmanual mode and activates CP that proceeds with sharpening of the following teeth.